3. Department of Pharmacology and Therapeutics, College of Medicine and Health Sciences, United Arab Emirates, University, Al Ain, Abu Dhabi 17666, United Arab Emirates. Cyclophosphamide (CYP) induced hemorrhagic cystitis is a dose-limiting side effect involving increased oxidative stress, inflammatory cytokines and suppressed activity of nuclear factor related erythroid 2-related factor (Nrf2). 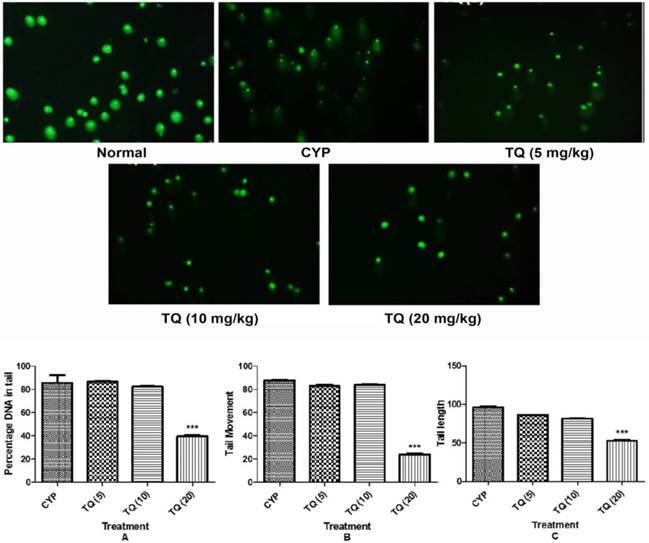 Thymoquinone (TQ), an active constituent of Nigella sativa seeds, is reported to increase the expression of Nrf2, exert antioxidant action, and anti-inflammatory effects in the experimental animals. The present study was designed to explore the effects of TQ on CYP-induced hemorrhagic cystitis in Balb/c mice. Cystitis was induced by a single intraperitoneal injection of CYP (200 mg/kg). TQ was administered intraperitoneally at 5, 10 and 20 mg/kg doses twice a day, for three days before and three days after the CYP administration. The efficacy of TQ was determined in terms of the protection against the CYP-induced histological perturbations in the bladder tissue, reduction in the oxidative stress, and inhibition of the DNA fragmentation. Immunohistochemistry was performed to examine the expression of Nrf2. TQ protected against CYP-induced oxidative stress was evident from significant reduction in the lipid peroxidation, restoration of the levels of reduced glutathione, catalase and superoxide dismutase activities. TQ treatment significantly reduced the DNA damage evident as reduced DNA fragmentation. A significant decrease in the cellular infiltration, edema, epithelial denudation and hemorrhage were observed in the histological observations. There was restoration and rise in the Nrf2 expression in the bladder tissues of mice treated with TQ. These results confirm that, TQ ameliorates the CYP-induced hemorrhagic cystitis in mice through reduction in the oxidative stress, inhibition of the DNA damage and through increased expression of Nrf2 in the bladder tissues. Cyclophosphamide (CYP) remains the first line therapy in treatment of large granular lymphocyte leukaemia and metastatic breast cancer . However, hemorrhagic cystitis is its dose limiting side effect implicating damage to the urothelium of the urinary bladder mucosa. CYP-induced cystitis leads to dysuria and gross hematuria and its repeated use over a period may lead to bladder cancer [2, 3]. CYP is an inactive prodrug that gets metabolized to acrolein and phosphoramide. Acrolein increases the production of reactive oxygen species (ROS) including peroxynitrite which play a major role in the induction haemorrhagic cystitis and DNA damage [4, 5]. In the presence of reactive unsaturated aldehyde residues, acrolein cleaves the proteins and breaks the DNA strands leading to cell death . It activates the formation of glutathionyl propionaldehyde (GTPD) from glutathione and thereby induces oxidative stress and generation of ROS in the urothelium . The ROS including peroxinitrites are involved in DNA damage and depletion of the energy source of cells ultimately inducing cell death . The subsequent destruction of urothelium further exposes the underlying smooth muscles and blood vessels to urine leading to further damages. A recent review on the methods for prevention of CYP-induced cystitis concludes that the cytokines, ROS, and modulation of transcription factors are involved in the pathogenesis of cystitis . Mesna is widely used and is relatively successful in the treatment of CYP-induced cystitis. Still, there is a need of other drugs to selectively reduce the CYP-induced cystitis. Thymoquinone (TQ), an active constituent of Nigella sativa seeds (Family: Ranunculaceae) is reported to reduce various chemical toxicities including CYP-induced pulmonary injury , cisplatin-induced hepatotoxicity and kidney injury [9, 10], and acetaminophen-induced hepatotoxicity . TQ possesses potent antioxidant activity, induces phase-II antioxidant enzymes and reduces lipid peroxidation in different tissues. These effects correlate with the increased expression of nuclear factor related erythroid 2-related factor (Nrf2) and resultant induction of phase-II enzymes observed in experimental animals treated with TQ [12-14]. These effects are also observed in vitro in HaCaT cells co-incubated with TQ . Induction of Nrf2 is involved in the protective effects of TQ against doxorubicin-induced nephrotoxicity in experimental animals and cytotoxicity against human leukocytes , . In the light of these reports, the protective effect of TQ was evaluated against the CYP-induced hemorrhagic cystitis in mice. In this study, the antioxidant and DNA protective effects of TQ in the bladder tissue were determined by the DNA fragmentation assay and comet assay. 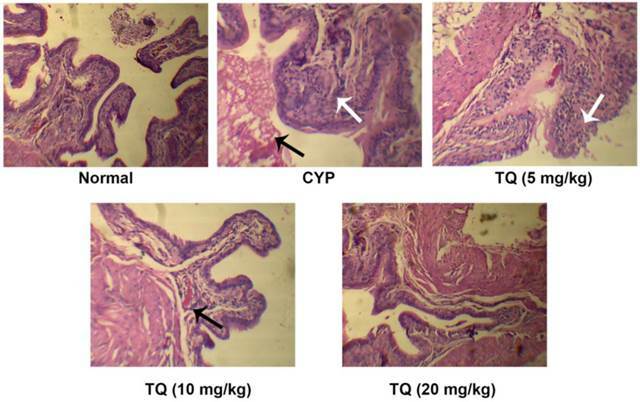 Further, the effect of TQ on the expression of Nrf2 protein in the bladder sections was estimated by immunohistochemistry to determine the involvement of antioxidant and Nrf2- mediated effects of TQ against CYP-induced cystitis. CYP (CAS No. 6055-19-2) procured from Cadila Healthcare Limited, B. No. BCP 1Q27), TQ (CAS No. 490-91-5) and 1,1,3,3-tetraethoxypropane were bought from Sigma-Aldrich, USA), RNase A (LOT No: 251014) (Merck, Bangalore), NBT (CAS No. 298-83-9) and 6X DNA (LOT No.0000207289) loading dye were obtained from Hi-media Laboratories Ltd., India., Nrf2 (C-20): sc-722 primary antibody (Lot number B1215), goat anti-rabbit IgG-FITC: sc-2012 secondary antibody (Lot numberG2314) and ImmunoCruz™ rabbit ABC Staining System: sc-2018 (Lot number L0114) were obtained from Santa Cruz Biotechnology, Inc., USA. All animal experiment protocols were approved by the Institutional Animal Ethics Committee (Registration No. 651/02/C/CPCSEA; Protocol approval number IAEC/RCPIPER/2014-15/11). Thirty male Balb/c mice (18-25 g) were procured from the central animal house facility of the institute. The animals were placed in polypropylene cages, kept at room temperature (25±2 ◦C), with 50±10% humidity along with a controlled 12 h light and 12 h dark cycle. Standard palletized feed (Amrut Feed, Pune, India) and tap water were provided ad libitum. Animals were acclimatized to the experimental conditions for a period of one week before the initiation of the experiment. All animals were maintained as per the standards prescribed by the Committee for the Purpose of Control and Supervision of Experiments on Animals (CPCSEA, Government of India). The dose of thymoquinone, body weight and intraperitoneal route for its administration was selected based on earlier studies [18-20]. Cyclophosphamide was diluted in saline (0.9 % NaCl) prior to injection and thymoquinone was freshly prepared in olive oil (Figaro, Spain) prior to administration [21, 22]. The study design and dosing schedule are represented in Figure 1. Cystitis was induced in mice by intraperitoneal administration of CYP at 200 mg/kg. The detailed experimental schedule was described in fig. 1. On day 1, all the mice were administered with suspension of TQ (5, 10 and 20 mg/kg, i.p.) except the normal treated mice were administered with vehicle (Olive oil) for 3 consecutive days. On day 4, all the mice (except normal treated group) were administered with CYP (200 mg/kg, i.p. ).From fifth day onwards, the mice were administered with TQ (5, 10 and 20 mg/kg, i.p. respectively) for 3 consecutive days. On the eighth day, all the mice were sacrificed and the bladders were immediately isolated, weighed and processed for the histological and biochemical examination. The bladder tissue was removed through a lower midline abdominal incision and stored in 10% formalin solution. These specimens were split longitudinally and processed for histological examination using haematoxylin and eosin staining. The severity of CYP-induced inflammation was estimated in terms of mucosal abrasion, haemorrhage, leukocyte infiltration and oedema according to the protocol described by Ozcan et al., 2005 [11,23]. Mucosal abrasion was identified as erosion of the mucosa. The presence or absence of mucosal abrasion and haemorrhage was observed at 100x magnification. Leukocyte infiltration into the tissue bed and edema was determined at 400x magnification. The severity of the oedema was represent as absence of oedema (-),mild oedema with no alteration in the width of the submucosa (+), moderate oedema with an increase of less than twice the width of the submucosa (++) and (+++) indicated severe oedema with an increase of more than twice the width of the submucosa . The bladder was isolated and the mucosa was scraped onto 1 ml of chilled homogenizing buffer containing 0.075 M NaCl and 0.024 M Na2-EDTA. The content was homogenized at 500 rpm followed by centrifuged at 700 g for 10 min at 0 oC. The precipitate was re-suspended in chilled homogenized buffer to obtain cell suspension of 1 x 105cells/ml. From each sample 50 µl of cell suspension was taken and added to 450 µl of 1 % low melting agarose. 100 µl of this mixture was instilled as a second layer on the pre-coated 1 % normal melting agarose (120 µl) on the slide. A third layer of 100 µl of 1 % low melting agarose was made. Each time the agarose instillation was followed with placing of cover slip for obtaining uniform surface. These slides were placed on ice for 5-15 min for agarose solidification. The slides were then kept in chilled lysis solution containing 2.5 M NaCl, 100 mM Na2-EDTA, 10 mM Tris, NaOH, freshly prepared 1 % triton X-100 and 10 % DMSO (pH 10.0) at 0oC in dark for 3 hrs followed by three washes with deionized water. Further, it was kept in chilled alkaline solution containing 300 mM NaOH and 1 mM Na2-EDTA (pH 13-14) for 10 min in dark at 0 oC. 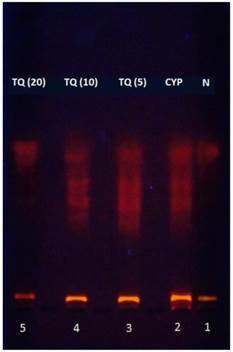 Electrophoresis was conducted at 0 oC in the dark for 2hr at 50 V and 250 mA in the buffer containing 0.4 M Tris (pH 7.4). Followed by electrophoresis the slides were stained with SYBR Green I solution [24,25]. Experimental protocol for CYP-induced hemorrhagic cystitis in mice. Inverted arrows indicate the treatment schedule for particular day. The figures in the parenthesis indicates dose in mg/kg i.p. (N: Normal; CYP: Cyclophosphamide; TQ: Thymoquinone). The microscopic images of 50 randomly selected cells were obtained using fluorescent Motic microscope attached to a Moticam 1000 video camera equipped with excitation (528/553 nm) and barrier (590 nm) filters. The parameter used to determine the DNA damage was tail moment and % DNA in tail and tail length. Tail length was determined as the distance of DNA migration from the nuclear core and was used to evaluate the extent of DNA damage. Tail moment was determined as a numerical measurement of DNA damage. It was calculated by multiplying the length of the “tail” of DNA trailing the nucleus and the percentage of total DNA content in the tail. An increase in the tail moment indicates increased DNA damage . The comets (tail moment) were analyzed using CaspLab software version 1.2.3 (CASPLab, Wroclaw) software . The DNA was isolated as per the protocol suggested by Tripathi and Jena , with slight modifications. The bladder tissue of equal weight was treated with cell lysis buffer (2.5 M NaCl, 100 mM Na2-EDTA, 10 mM Tris, NaOH, adjusted to pH 10, freshly prepared 1 % Triton X-100, followed by refrigeration at 4 oC for 60 minutes). After isolation, the DNA was re-suspended in 40 µl tris-EDTA buffer. After overnight incubation at 4 oC, RNase A was added and the mixture was incubated at 37 oC for1 hour. The 10 µl of the suspension was loaded into the wells with an equal amount of DNA loading dye. The gel was run at 50 V, for 3 hrs using 1 % agarose gel. The obtained gel was observed in UV-365 nm on aetron gel documentation system instrument using electro-optical system (EOS) utility software, India. The paraffin-embedded sections of bladder were placed on poly-L-lysine coated slides. The sections were sequentially treated with 100 % xylene, xylene: ethanol, 100 % ethanol, 90 % ethanol, 70 % ethanol, 50 % ethanol in a graded manner. Each treatment lasted for 3 minutes. The slides were then placed in distilled water for 10 minutes followed by incubation with citrate buffer (pH 6.0) at 95 oC for 5 minutes in water bath. Following this antigen retrieval the samples were cooled in citrate buffer for 20 minutes and washed thrice in deionized water followed by two washes in TBS for 5 minutes each. The specimens were then incubated for 1 hour in 1.5 % normal blocking serum in TBS followed by addition of Nrf2 primary antibody (Santa Cruz Biotechnology, Inc., USA). The slides were maintained at 4oC overnight. Followed by antibody treatments the slides were rinsed twice in TBS containing 0.025% triton X-100 incubated in 3% H2O2 in TBS at room temperature for 15 minutes. The biotinylated secondary antibodies were added and the slides were incubated for 30 minutes and rinsed thrice with TBS. Following the addition of AB enzyme the slides were incubated for 30 minutes and then rinsed thrice with TBS. The slides were developed with DAB reagent and rinsed with distilled water for 5 minutes, dehydrated and the microscopic images were captured using Motic AE31 microscope attached to MXH-100 camera supported with Motic Images plus 2.0 software. A 10 % bladder homogenate was prepared in ice chilled phosphate buffer (50mM pH 7.4). The homogenate was centrifuged at 2000g for 20 min at 4 ⁰ C and 100 µl of the supernatant was used for the estimation of TNF-α, IL-1β and IL-6 using ELISA kits. The bladder tissue was transferred to ice-cold phosphate buffered saline (pH 7.4) and cross-chopped with a surgical scalpel into fine slices, suspended in chilled 0.25 M sucrose solution and quickly blotted on a filter paper. Tissues were minced and homogenized finally to release soluble proteins in ice cold tris hydrochloride buffer (10 mM, pH 7.4). The homogenate so formed was centrifuged at 7000 rpm for 20 minutes using high speed centrifuge and the supernatant was used for estimation of tissue parameters. Lipid peroxidation in the bladder tissue was determined as MDA content by determining the thiobarbituric acid reactive substances. Briefly, 0.2 ml of homogenate was mixed with 0.2 ml of 8.1% sodium dodecyl sulphate, 1.5 ml of 30% acetic acid (pH 3.5) and 1.5 ml of 0.8% thiobarbituric acid. The reaction mixture was heated for 60 min at 95 °C and cooled on ice bath. After cooling, 1.0 ml of distilled water and 5.0 ml of n-butanol: pyridine (15:1 v/v) solution was added to each tube and the tubes were centrifuged at 5000 rpm for 20 minutes. The pink colored organic layer was separated and optical density was measured at 532 nm. 1,1,3,3-tetraethoxypropane was used as a reference standard for MDA. To 100 µl of tissue supernatant, 2.85 ml of 0.1 M phosphate buffer (pH 8.4) and 50 µl of 7.5 mM pyrogallol were added and optical density was measured at 420 nm for 3 min at 30 s intervals. Enzyme levels were expressed as SOD activity in units per mg protein. Briefly, 100 µl of tissue homogenate was mixed with 100 µl of 10% trichloro acetic acid and vortexed. The contents were then centrifuged at 5000 rpm for 10 min. Subsequently 0.05 ml of supernatant was mixed with a reaction mixture containing 3.0 ml 0.3 M phosphate buffer (pH 8.4) and 0.5 ml DTNB [5, 5′ dithiobis-(2-nitrobenzoic acid)]. Within 10 min, the absorbance was measured at 412 nm using a spectrophotometer. GSH was determined from a standard curve produced using commercially available standard GSH (Sigma Chemicals, USA). The amount was expressed as µg/mg of protein. For estimation of catalase activity, 50 µl of tissue supernatant was taken and to it 1.0 ml of 50 mM phosphate buffer (pH 7) and 0.1 ml of 30 mM hydrogen peroxide were added. The decrease in absorbance at 240 nm was measured at 5th and 30th seconds. Catalase levels were expressed as units of catalase per mg protein [31, 32]. The statistical analysis was performed using Graph Pad Prism version 6.0 software, USA. The results were expressed as mean ± S.E.M. The data sets of the experimental parameters were analysed using one-way analysis of variance (ANOVA) followed by Dunnett's post-hoc test and p<0.05 was considered to be statistically significant. Light microscopic evaluation of the bladder sections revealed, CYP-treatment induced epithelial denudation, hemorrhage, nuclear infiltration and edema (black arrow) along with mild to moderate inflammatory exudates in the mucosa (white arrow). TQ dose dependently restored the bladder architecture and reduced CYP-induced inflammatory alternations. The mice treated with 10 mg/kg TQ had mild congestion in mucosa (black arrow) and no inflammatory exudates whereas, those receiving 20 mg/kg TQ had mild congestion in the mucosa and complete protection of bladder tissues from CYP-induced inflammatory changes (Figure 2). The bladder histology of this group was similar to that observed in the normal mice (Table 1). Effect of TQ on urinary bladder histopathology in CYP- induced hemorrhagic cystitis. Normal mice or control mice showed normal structure and architecture of bladder as compared to CYP treated group, Whereas mice treated with CYP showed increase in the nuclear infiltration, hemorrhage and edema, animals treated with TQ showed dose dependent mild edema and decrease the epithelial denudation as compared to CYP treated mice. The group treated with high dose of TQ showed higher improvements when compared with its low and medium dose (Scale bar: 20 µm). Agarose gel electrophoresis was conducted to analyze the pattern of the DNA fragmentation. CYP-treated mice showed significantly greater DNA fragmentation as apparent from the DNA ladder formation after electrophoresis of the genomic DNA. The genomic DNA samples isolated from bladders of mice treated with 5, 10 and 20 mg/kg TQ had reduced DNA ladder formation indicating inhibition of DNA fragmentation (Figure 3). This effect was most prominent in the mice treated with 20 mg/kg dose of thymoquinone. The extent of DNA damage was also assessed using various parameters derived through comet assay including tail moment, tail length and percent DNA content in the comet tail. The migration extent (tail length) of the DNA, besides, the percentage of DNA in the tail has been shown to be proportional to the frequency of DNA strand-breaks, and results might either be expressed by gathering cells into different damage categories according to the amount of DNA in the tail. 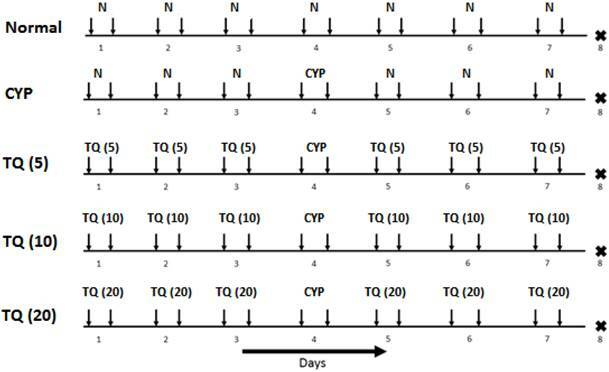 Samples from CYP-treated mice had significantly higher percentage tail DNA content (p<0.001), tail moment (p<0.001) and tail length (p<0.001) as compared the samples from the normal mice. The samples from mice treated with 20 mg/kg TQ had reduced percentage DNA in tail, tail moment and tail length (p<0.001) respectively (figure 4). Effect of TQ on DNA damage in CYP-induced hemorrhagic cystitis. The figures in the parenthesis indicated dose in mg/kg intraperitoneal N: Normal; CYP: Cyclophosphamide; TQ: Thymoquinone. The protein expression of Nrf2 was estimated by immunohistochemistry as shown in Figure 5. The expression of Nrf2 decreases whenever there is an oxidative stress and bladder sections of CYP-treated rats had reduced Nrf2 expression. The TQ treatment reverted the Nrf2 suppression induced by CYP and most prominent expression of Nrf2 protein was evident in the group receiving 20 mg/kg of TQ. To further define the mechanisms by which cytokine signaling may be associated with CYP- induced hemorrhagic cystitis, we examined the effect of TQ on release of pro-inflammatory cytokine expression of TNF-α, IL-1β and IL-6 in the tissue homogenate. The groups treated with CYP showed marked increase in the level of cytokines (p<0.001) as compared to normal group, whereas treatment with the TQ showed decrease in the level of TNF-α, IL-1β and IL-6 in dose dependent manner indicating a consistent inhibitory effect on the cytokine release (Figure 6). Oxidative stress eminence was evaluated by the measurement of MDA level as a marker of lipid peroxidation, GSH level as well as SOD activity and catalase activity as markers of enzymatic and non-enzymatic antioxidant defense systems. CYP induced a state of marked oxidative stress as demonstrated by significant increase (p<0.001) in the MDA level and a significant decrease in the GSH level (p<0.001), SOD (p<0.001) and catalase (p<0.001) activities in bladder tissue homogenates. 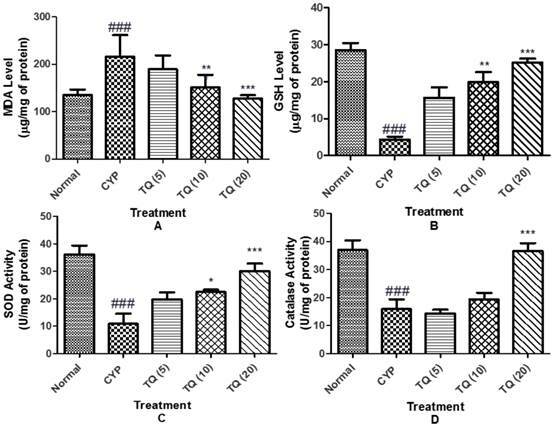 Treatment with TQ alleviated the effect on the MDA and GSH levels, as well as SOD and catalase activities (figure 7). Effect of TQ on the release of pro-inflammatory cytokines in CYP- induced hemorrhagic cystitis. (A) Tumour necrosis factor-α (TNF-α). (B) Interleukin-1β (IL-1β) (C) Interleukin-6 (IL-6). Data is expressed as mean ± SEM and analyzed by one way ANOVA followed by Dennett's post hoc test. Figures in the parenthesis indicated dose in mg/kg intraperitoneal *p<0.05, **p<0.01, ***p<0.001 as compared to CYP and ### p<0.001 as compared to normal (CYP: Cyclophosphamide; TQ: Thymoquinone). The present study revealed that TQ exhibits a protective effect against CYP-induced hemorrhagic cystitis by improving organ function, restoring the endogenous antioxidant system, preventing the increased level of inflammatory cytokines such as TNF-α IL-1β and IL-6 & DNA fragmentation; reducing lipid peroxide metabolism; and preserving the tissue structure and morphology of urinary bladder via activation of the Nrf2 signaling pathway. The present study shows for the first time that TQ exerts its organ-protective effects not only through its antioxidant effect but also in part by up regulating the Nrf2 pathway. Therefore, our study provides direct evidence that the Nrf2 signaling pathway plays a key role in regulating oxidative stress and subsequent CYP induced-injury in experimental animals. To the best of our knowledge, this is the first study to describe the protective effect of TQ against cyclophosphamide-induced hemorrhagic cystitis through inhibiting DNA damage and up regulating Nrf2 expression in mice. The CYP-induced hemorrhagic cystitis in mice is used as an experimental model of the human diseases like urinary bladder inflammation, mastocyte infiltration, and urothelium disruption. This model represents the adverse effects of the toxic metabolites of CYP, phosphoramide and acrolein, which exert the cytotoxic effects on the rapidly dividing cells [33, 34]. These metabolites slow down the growth of cancer cells by interacting with the cellular DNA. Phosphoramide is mainly responsible for the mutagenic effect of CYP. In present investigation the protective efficacy of twice a day intraperitoneal administration of TQ at 5, 10 and 20 mg/kg doses against CYP-induced cystitis was evaluated. The pharmacokinetics of TQ in rabbits is recently reported and there is a dearth of information on the pharmacokinetics of TQ in other species of experimental animals. We selected twice a day dose regimen for TQ administration considering that its elimination half-life in rabbits is 3.96 ± 0.19 hours after extra vascular administration . A preliminary investigations carried out in our laboratory on the protective effects of TQ at graded doses (5 to 40 mg/kg, twice a day) revealed that TQ dose-dependently protected mice against CYP-induced alterations in the bladder histology. However, the 40 mg/kg dose appeared to induce more inflammatory damage of the bladder tissue. Hence, in the main study TQ was tested at 5, 10 and 20 mg/kg b.i.d doses. Similar doses for evaluating chemopreventive effect of TQ against cisplatin toxicity have been evaluated . It is well documented that CYP-induced cystitis involves increased in oxidative stress and inflammation. The characteristic histological perturbations related CYP-induced cystitis like epithelial denudation, hemorrhage; cellular infiltration and edema were observed in present study. 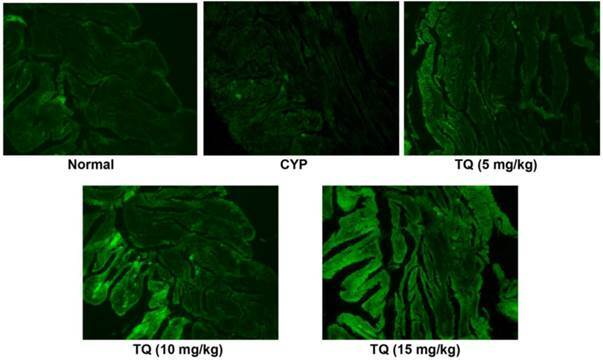 It is well reported that TQ has multi-organ protection activities against chemically induced nephrotoxicity  and cardiotoxicity . In present study, TQ dose-dependently inhibited the release of inflammatory cytokines including IL-1, IL-6 and TNF-α. This cytokine inhibitory effect of TQ might has contributed to the protection of bladder architecture and reduced inflammatory infiltration in the bladder tissue. The role of TNF-α in CYP-induced cystitis has been established. Therefore, the organ protection activity might be due to inhibition of proinflammatory cytokines in CYP-induced cystitis. CYP possesses pro-oxidant nature and induces oxidative stress through decreasing the activities of the antioxidant enzymes. It increases the extent of the lipid peroxidation . In the present study, CYP treatment significantly increased the MDA levels in the bladder homogenate indicating enhanced lipid peroxidation. A decrease in the GSH levels and activities of catalase and SOD were also observed in CYP treated mice. A reduction in the GSH content may be attributed to the direct conjugation of CYP metabolites with the free or protein bound -SH groups. The pro-inflammatory component of the CYP-toxicity may also contribute to the disturbance of overall redox cycling in the bladder tissues . It was observed that the TQ treatment significantly reduced the extent of lipid peroxidation and improved the levels of GSH and activities of SOD and CAT. Nrf2-mediated cytoprotection has been shown to be critical for the tissues that are vulnerable to oxidative stress. Therefore, Nrf2 is recognized as an important molecular target for a number of chemopreventive and cytoprotective agents . In present study, treatment of mice with CYP led to a reduction in Nrf2 protein expression and subsequent rise in the oxidative stress. This action is due to CYP metabolites that suppress the activity of Nrf2 and inhibit phase II antioxidant enzymes leading to increased oxidative stress and tissue damage. In current study, we observed that Nrf2 expression was significantly increased after TQ treatment. Recently, TQ is reported to induce phase-II enzymes involved in the antioxidant activities through activation of the Nrf2 pathway . Also, TQ has been reported to enhance the level of Nrf2 expression and increase the expression of genes involved in the recognition and repair of damaged DNA/fragmented DNA. This effect could provide secondary protection against DNA damage that enhances the cell survival . TQ is a strong antioxidant and its indirect antioxidant action is mediated through the activation of transcription factor Nrf2 protein in the bladder tissue. The role of oxidative and nitrosative stress in the CYP-induced bladder damage is reported earlier 2007 . It is suggested that TQ might induce the phase-II enzymes NQO-1 and HO-1. However, further investigation is warranted to confirm such induction of the phase-II enzymes. Increase in oxidative stress may lead to damage to DNA as observed by comet and modified comet assay parameters according to the experiment conducted by Tripathi and Jena . The DNA fragmentation assay for the estimation of DNA damage in mammalian cells has several advantages over other cytogenetic bio-assays . Treatment of mice with CYP significantly increased the DNA damage in the bladder cells. This was evident from the increased tail movement and increased tail DNA content as observed in the comet assay. These results indicate that the TQ treatment protects against the CYP-induced DNA damage. Moreover, the DNA damage analysis using DNA ladder assay reveals increased fragmentation and formation of low molecular weight DNA bands in the CYP treated animal samples. Fragmentation in DNA leads to apoptosis of the cell and produced the internal toxicity leads to cell death . Treatment with the TQ dose dependently provides the protection against CYP-induced DNA fragmentation. This effect can be attributed to the earlier reported free radical scavenging and anti-apoptotic activity of TQ [14, 45]. Thus, we conclude that the TQ reduces oxidative stress, inflammatory cytokines and DNA fragmentation in CYP-induced cystitis via the Nrf2 pathway. Future investigation targeting molecular pathways involved in the protective action of TQ on CYP-induced cystitis are warranted to confirm the role of TQ in CYP-induced cystitis. CYP: Cyclophosphamide; TQ: Thymoquinone; Nrf2: Nuclear factor erythroid 2-related factor 2; ROS: Reactive oxygen species; NF-κB: nuclear factor- κB; GTPD: Glutathionyl propionaldehyde; HO1: hemooxugenase-1; NBT: Nitro blue tetrazolium; FITC: Fluoroisothyocynate; EOS: electro-optical-system; NQO-1: NADH quinone oxidoreductase 1. The authors acknowledge the financial support to the research works in the laboratory of Dr. Shreesh Ojha from United Arab Emirates University, United Arab Emirates. Corresponding authors: Dr. Chandragouda R. Patil1 and Dr. Shreesh Ojha2. 1Department of Pharmacology, R. C. Patel Institute of Pharmaceutical Education and Research, Shirpur, District-Dhule, Maharashtra, 425405, India, Phone: +91-2563-251808, Fax: +91-2563-255189, E- mail: xplore.remediescom (C. R. Patil). 2Department of Pharmacology and Therapeutics, College of Medicine and Health Sciences, United Arab Emirates, University, PO Box: 17666, Al Ain, Abu Dhabi, United Arab Emirates, Phone: 00971-3-7137524; Fax: 00971-3-7672033, E-mail: shreeshojhaac.ae (S. Ojha).